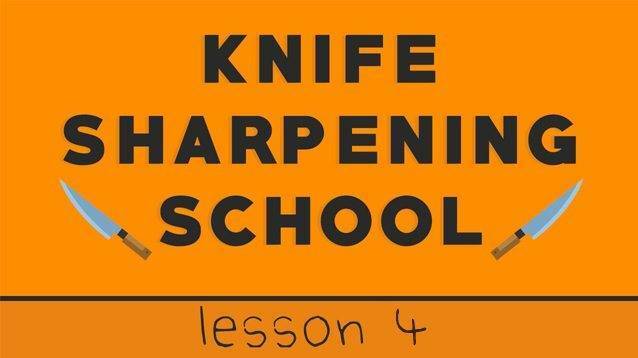 In this 4th lesson of the KnifePlanet Sharpening School I want to talk about something that changed my sharpening life, it enabled me to make knives sharper than they have ever been and it is an uncomplicated process. Also, the application of these varying levels of pressure may vary on asymmetrical knives, so for the purpose of this video and article, I am working on a knife with even bevels on both sides, 50/50 (Symmetrical). Burr Forming Pressure (P4) is the heaviest amount of pressure I use and I only use this once during the sharpening process, it is the level of pressure that I require to raise a burr and once that is done, once that burr has formed from tip to heel on both sides of the knife, I never use that level of pressure again on that same knife. Burr Forming Pressure (P4) is not a constant, defined level of pressure, it may vary for each knife. So if I pick up a knife that is very dull, than I know that I will require a substantial level of pressure to form the burr. However, if the knife is not too bad, dull yes, but the edge is not deformed or in terrible condition, I will tone that level of pressure down a little. So as previously instructed, prior to any sharpening, please take a good look at the edge and form a sharpening plan in your head. Never just pick up a knife and start grinding with heavy pressure without a prior check at the condition of the knife. My burr forming pressure needs to vary because my goal is to create a burr that is as subtle as I can make it, I don’t want to blindly grind metal away by picking up every single knife and treating it the same way. So I use the appropriate level of Burr Forming Pressure to get the burr formed. You can experiment with this, pick up the knife and use a moderate level of pressure to see if the burr is forming in reasonable time frame, 1-3 minutes. If nothing is happening, then you can adjust the pressure. The time required to form the burr using the Burr Forming Pressure will differ depending on the knife itself, whether it is soft or hard, stainless or carbon. It will depend on the stone you choose to start with, is it a 400 grit or a 1,000 grit stone. Also, your level of skill will be a determining factor. It is important to keep your angle stable, so never use a level of pressure that hinders your ability to maintain consistency and becomes uncomfortable, if that is the case, you are using way too much pressure. 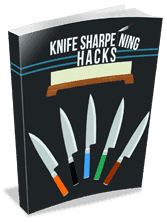 The bottom line is that you need to pick up each knife, look and feel the edge and form a sharpening plan. Before I start any sharpening of a knife a series of plans unfolds. 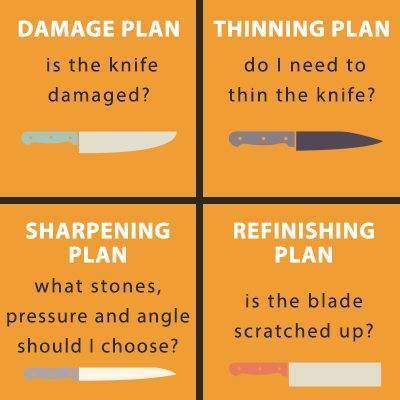 DAMAGE PLAN: Is the knife damaged, do I need to repair chips, or the tip? SHARPENING PLAN: What progression of water stones do I need, what Sharpening Angle should I choose? How much pressure to use? REFINISHING PLAN: Is the blade is scratched up? Do I need to fix that? No burr forms, after two to three minutes: I still flip the knife and now work on the opposite side using the same amount of pressure. The reason I do this is to maintain a balance of time, pressure and angle on both sides. If I were to continue grinding on one side until a burr forms, regardless of the time it takes, could be five minutes, I may eventually create bevels of inconsistent size on either side of the knife. Once I have successfully formed a burr on both sides of the knife, consistent in size and running from heel to tip, I then reduce pressure by roughly 50%. I NEVER use P4 or burr forming pressure again on the knife that I am working on. BURR FORMING PRESSURE HAPPENS ONCE. In an effort to achieve uniformity and consistency in bevels I follow the procedure below for the remainder of the process. Since I have achieved a burr, it is now time to remove it and it is important to strive to finish with an edge that is as clean as possible, free from any metal fragments that interfere with truly sharp knives. P3 Pressure: Light. Continuing on the COARSE stone, the same stone I used to form a burr in stage one, I move from tip to heel and from heel to tip on the right side of the knife. I now flip the knife and move from heel to tip and tip to heel. (Note: This is the way I sharpen. If you start at the heel on both sides of the knife, that’s fine too!). Remember, you don’t want to form additional burrs here. It is a challenge with a coarse stone not to, but by practicing pressure manipulation this way, you will learn. P2 Pressure: Very Light. Now I reduce the pressure again and still on the coarse stone I again move from Tip to Heel and Heel to Tip on the right side and flip the blade and move from Heel to Tip and Tip to Heel. P1 Pressure: Feather Light. Now for the final stage on the coarse stone I just “strop” the knife using trailing strokes, 3 strokes per side. This is the final stage for this stone before I check the edge. Edge Check. This is another extremely important and simple act that really made a big difference for me. I hold the edge under a good light and look for any reflections on the edge. If I have not removed the burr completely, it will be revealed here. It is easy to see. If I do see any reflections, I just go back to P2 pressure, very light pressure, and repeat the process. Then, I check again under the light. I concentrate on the area of the edge where the reflections appeared. You’re holding the knife with the edge up here. This is the final check before moving on to another stone. Now that the hard, critical work is done, i.e. burr formed and initial removal process complete, I switch to a medium stone, 1,000 grit. Now starting with P3 pressure, which again is nice and light, I repeat the process as laid out above, moving from tip to heel and heel to tip on both sides, then I do the same with P2 pressure and finally the stropping motion (P1) and the pressure is feather light here, as light as you can get it. Now, I move to my finishing stone, usually a 5,000 grit stone and repeat the process and would do the same if I was going to use an 8,000 grit stone. My final act may be stropping on bare leather. That is it, this all takes me about 12-15 minutes on a dull knife. Don’t worry about the timing. The burr forming, P4 pressure stage can take anywhere from 1 minute to 7 or even more. It will depend on the steel, the condition of the knife, the burr forming stone you use and your skill. I don’t count strokes, so what I do is to work from tip to heel and heel to tip on both sides as evenly as I can. I do my best to maintain the same pressure and angle but all this takes time to learn. The knowledge that I should do this, or try to do it at least was for me, the most important thing. If you have just the one Japanese Water Stone, a 1,000 grit for example, you can still follow this pressure plan, it’s just a matter of doing it all on the one stone, it’s not any more complicated. Thank you for reading, please don’t hesitate to ask questions in the comments if anything is unclear. Also, if you are a complete novice, you may find the process of using four levels of pressure a little overwhelming. That is fine, just start with two levels of pressure, Burr Forming and Burr Removal, that is all there is too it. As a disclaimer, the purpose of this video is not an attempt on my part to claim responsibility for creating a four level pressure system, I am sure lots of folks do this anyway. It is just something I picked up in 2012 after a brief encounter with a Japanese Sharpener I met in NYC. Thank you very much Peter for your time to show people you don’t even know how to sharpen knives. You rock! Thsnk you. Thank you Shawn. I’m hoping you meant to say “who don’t even know how to sharpen knives rather than “you “. Thank you watching. a question for more precision, after getting the burr on both sides of the knife, how about about time for step 2 (burr removal) with the first stone then how about about step 3 with stone 1000 and for step 4 with 5000 and 8000? less and less time at each stage I imagine. I do not know very well when it is necessary to change the steps and on what criterion apart, of course, when we got the morfil which we feel well scratch the finger. Alain, thank you for watching and reading. 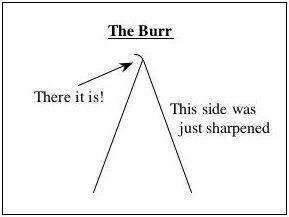 I spend the majority of my time on the first stone to raise the burr on both sides. I continue on the first stone for a short period to start the burr Removal process. When I switch to the 1,000 stone things go more quickly and I follow a pattern which promotes consistency. Tip to heel then heel to tip on one side then flip and repeat. I do that for a total of 3 times while reducing pressure each time. Then I move to the next stone and repeat. I don’t feel for a burr during this stage because I know I removed it on the first stone. In fact I wouldn’t switch to the second stone unless I did remove it. So for me there is a burr formation stage and then it is all about burr removal, cleaning the Edge by diminishing levels of pressure. I hop this helps. Awesome lesson as usual. Looking forward to reading the next! This was my favorite so far, thank you so much for putting this together. Loving the series Peter. You’re very kind to do this for the community. Thank you all for your awesome comments, it means a lot that you just take the time to reply. Ferdinando, we will be doing a lesson on repairing knives, i.e. a damageplan. Ross, yes I or Jon will be focusing the remainder of the lessons and sharpening and repairing double beveled Japanese knives and also Jon will do one on SIngle Bevel knives.